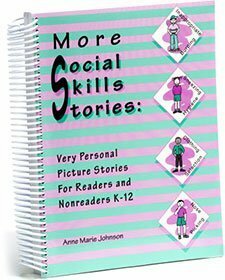 Book contains a series of short stories designed to help students improve their social interaction skills. Stories depict the appropriate or inappropriate use of communication. Stresses personal hygiene skills with ready-to-use stories. Characters explore the following topics: Morning Routines, Improperly Fitting Clothes, Sneezing Hygiene, Nose Picking, Inappropriate noises/Burping, and Improper Self-Touching.